South East Asia is a bright spot in the global economy. The outlook for the region is sustained, healthy growth of more than 5% per year between now and 2022. (i) Against this backdrop, business sentiment has hit a new high. We explore what is driving this positivity and find that infrastructure emerges as a source of real opportunity for ASEAN firms in the coming years. At the same time, however, concerns over climate change loom large. Greater cooperation will be key to overcoming these environmental risks. 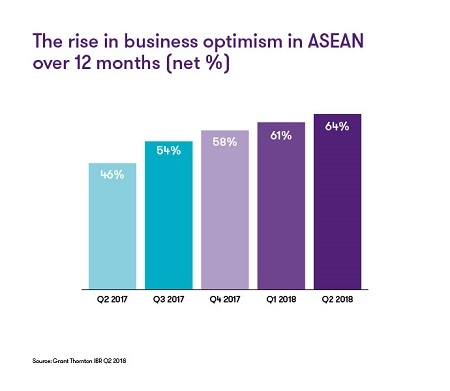 Business optimism among ASEAN businesses is at record levels. Net 64% of firms are optimistic about the outlook for their economy over the next 12 months, according to Grant Thornton’s International Business Report (IBR). Amid this wave of positivity, infrastructure investment is high on the agenda. When asked to select the biggest opportunity for the Asia Pacific (APAC) region over the next five years, 42% of business leaders cited upgrading local infrastructure. As populations become more urban and more integrated with technology, businesses need infrastructure improvements to remove any potential roadblocks. This will require significant investment. The Asian Development Bank estimates that the total outlay for infrastructure investment between the middle of this decade and 2030 could total US$2.8trillion. (v) With these sorts of numbers making headlines, it is no surprise that ASEAN finance ministers have been busy pitching infrastructure projects to investors. After infrastructure, Southeast Asian businesses cite increased ASEAN economic cooperation as the next biggest opportunity for the APAC region (36%). The importance of cooperation across this region becomes even clearer when looking at what firms see as their biggest future threats. Top of the list among ASEAN businesses is regional conflicts regarding competing territorial claims. Nearly one in three firms (29%) say this is what keeps them awake at night most. The South China Sea is a major trade route and there are many different nations claiming rights to own part of the area. China and the ASEAN countries agreed a draft code of conduct earlier this year which aims to settle these long-running disputes. (vii) This represents encouraging progress. However, businesses will need more certainty before this ceases to be such a prominent concern. The opportunities for businesses in the ASEAN region are significant. Particularly for those businesses involved in digital and physical infrastructure improvements underpinning a new wave of development. As economic and business ties across Southeast Asia strengthen, ensuring cooperation will be key to mitigating the challenges our research has identified. Ultimately this will lay the foundation for sustainable growth. To understand more about the opportunities in the region and how your business can capitalise, contact Rodger Flynn, CEO of Grant Thornton Singapore and Regional Head of Member Firm Development, Asia Pacific.